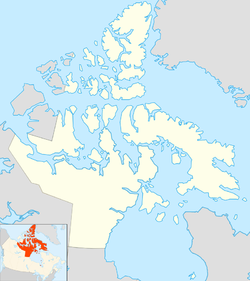 Iqaluit (Inuktitut: ᐃᖃᓗᐃᑦ, IPA: /iqɑluit/) is the lairgest ceety an territorial caipital o the Canadian territory o Nunavut. Till 1987, it wis cried Frobisher Bay, a name that is still occasionally uised. Iqaluit is locatit on the sooth coast o Baffin Island at the heid o Frobisher Bay. As o the 2011 census the population wis 6,699, an increase o 8.3 percent frae the 2006 census; it haes the lawest population o ony caipital ceety in Canadae. Indwallers o Iqaluit are cried Iqalummiut (singular: Iqalummiuq). ↑ "Council Members". City.iqaluit.nu.ca. Retrieved 2011-03-02. ↑ 6.0 6.1 6.2 "Canada 2011 census". 2.statcan.ca. 2012-02-08. Retrieved 2012-02-08. This page wis last eeditit on 11 Mairch 2018, at 08:44.